Mark Radice is one of those really interesting figures in the music business whose story really deserves telling. Unfortunately, he never responded to my interview requests, so you’re going to have to settle for my version. Radice was a child star whose first single, 1967’s “10,000 Year Old Blues,” was released when he was ten years old. This cut is a bit of a novelty because it features pre-Aerosmith Steven Tyler. 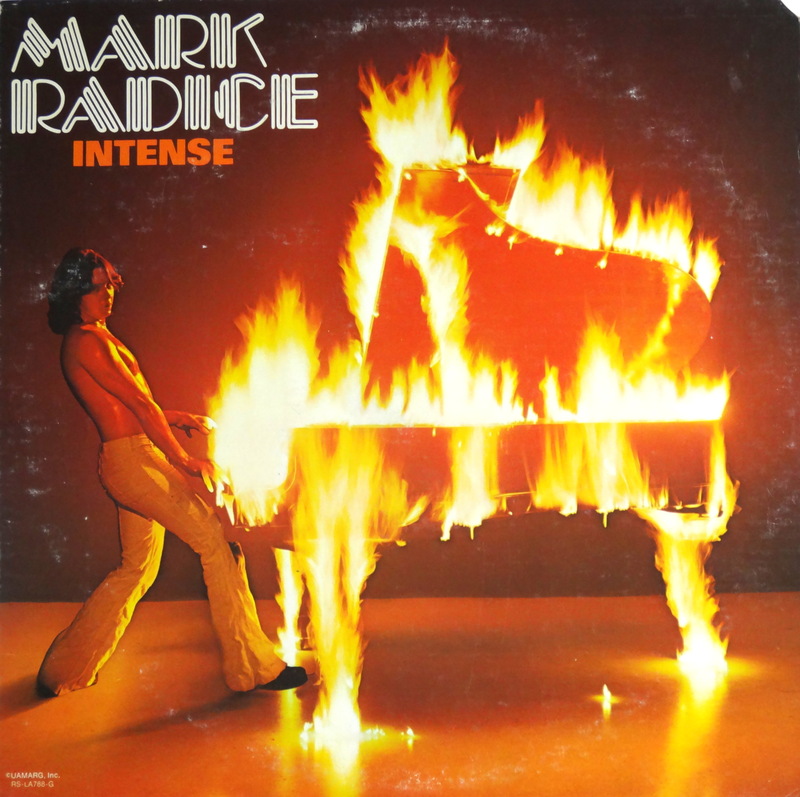 Throughout the seventies and eighties Radice wrote for other artists and played keyboards for the likes of Donovan, Cheap Trick, and Aerosmith, appearing on the latter’s must-have Live Bootleg! Since the eighties Mark has written songs for Sesame Street, and he continues to record his own material. You can check him out on Youtube. As for Intense; well, I picked it up hoping that it would be as funky as Ain’t Nothin’ But A Party, but it isn’t. Intense tends more toward the disco end of the spectrum, which isn’t exactly my pair of Angel Flights. I keep the album around for the cover, though, which has potential. What do you think: Is Intense worthy of a spot in the The Bad Album Cover Hall of Fame? I’m listening. Perhaps for tagging a cool image and a misnomer to Disco. Yes. I like the way you think, Milo. Oh my lord, yes. Shirtless, yellow bell-bottoms, shaggy dark hair, dancing and playing a piano in flames. It’s practically a perfect checklist for BACHOF. The acronym alone says it all. That’s two for the BACHOF. Unlike the Rock and Roll HOF, that’s enough to get you in. Three for the BACHOF? Oh, he’s definitely in now. Hi it’s Mark. Yeah, Radice. Count me in for BACHOF vote. I didn’t respond to your interview requests because however you “requested” one I never got the request.